Having just done the Shakespeare Marathon at Stratford-upon-Avon the title couldn’t be resisted! I want to aim this at first or second time marathoners; taking up the invitation from Ian P’s last blog on the website. 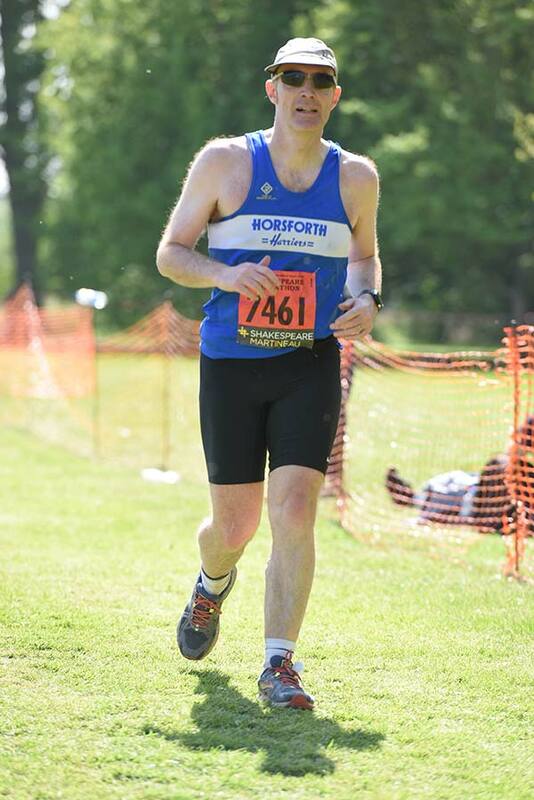 Not that I offer any expertise, (I still feel that I am a novice) more that having completed four marathons I might have some useful experiences to share. 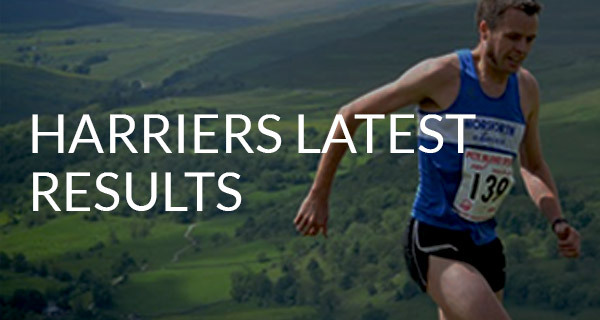 The answer to the question in the title is obviously “yes”, leaving aside the ‘ultra’ disciplines a marathon is the ultimate attainable challenge our sport offers. You may not realise it yet, but you want to have a go. I hope the following will help with the ‘when, how and why’, how to manage your expectations and emotions (as well as avoid my mistakes). You are a member of a very large, supportive and successful club – you won’t ever be short of help and advice. IS IT TOO FAR AND TOO HARD? Of course it is. But the point is to challenge yourself and experience the buzz and emotion of completion. Bear in mind that the first marathoner, Phillipides, died after covering the 25 miles or so from Marathon to Athens via Sparta. A warm-up based on mortal combat with the massed forces of the Persian empire may not have been conducive to a good time, but at least he would have run a PB! He probably died of dehydration – so I’ve put in a section below on how to look after yourself properly. WHAT WILL DETERMINE YOUR PERFORMANCE? The marathon can leave you with a feeling of disappointment as well as elation; maybe the one drawback of being in a club is that you know what other people have achieved and comparison becomes inevitable. But you are not other people; if you can look at these variables clearly and rationally, you will make sense of your performance. I have done four marathons, three of them clustering just above five hours and the glorious outlier, of 4:27 in 2014 at Manchester. I am not under any illusions about where that time sits in the overall scheme of things and I am in awe of people who can do sub 4 hour for a marathon (how in god’s name do you run that fast for that long?) but I regard my marathon pb as one of my finest achievements in life and finishing was a moment of elation. I had a good base fitness by my own standards in 2014 and I seem to remember being ‘up’ to 15 miles just before I began the formal training programme. A back injury last December prevented me from building my ‘base’ this time and I believe this was the main reason Stratford was above my target time. What do we conclude from this? 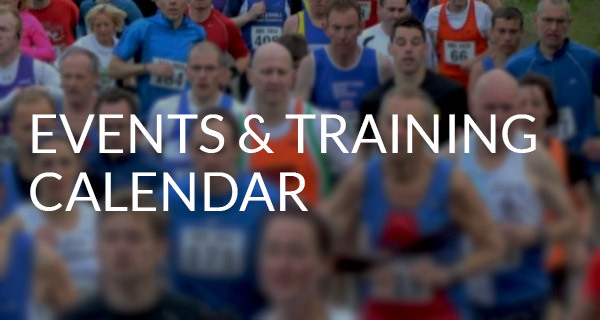 Firstly: you might see a whole variety of 14-16-week training schedules. They are misleading to some extent- if you want to do a competitive (#2) marathon, your first 20 miler is at week seven. You are not running that far, that soon, without a good base. Secondly: you in effect need a ‘training programme for the training programme’ unless you are beginning with a very good base fitness. You should see a #2 or #3 marathon as a six-month process or longer. The general advice seems to be in most sources that a basic competent competitive (#2) marathon starts at a bare minimum of three runs per week. Ideally this should be four to five runs per week with two clearly identified rest days. You should be peaking at about 40-50 miles per week, with your longest training run 21 days before race day. Your training plan should include a weekly longer steady run, some speed work (Thursday nights with Marie, Garth and Gordon) and 1-2 tempo runs per week, up to eight miles. You should also include some physical conditioning work. Your five longest runs should aggregate at 95-100 miles, perhaps 2 x 20 miles, 3 x 18 miles. I exceeded these ‘longest run’ targets for Stratford. 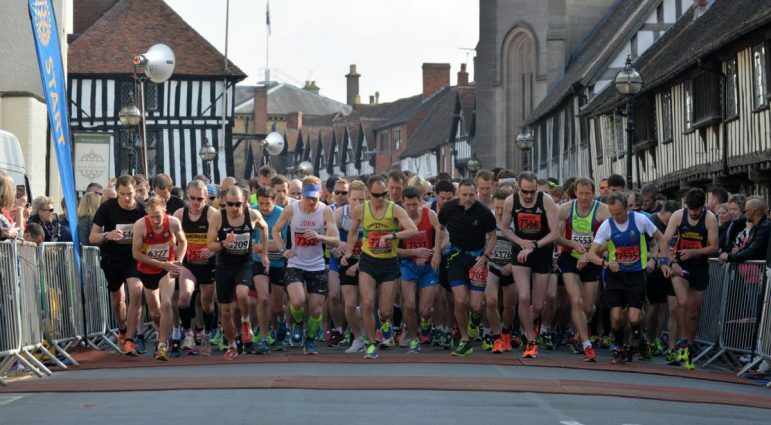 Your long run programme must end three weeks before race day, with a 14 miler two weeks before and an eight to ten miler a week before. Then there’s nailing it and there’s really nailing it. A #3 Marathon to go back to my scheme. Pushing much beyond the above may risk injury. However, if you can build to the 20-mile distance earlier in your training programme, or extend your formal training period, then why not do 10 x 20miles or 5 x 20miles? This is probably a bigger commitment than most people want to make, but may get you to the very outer edge of what your body can do. There is some debate as to whether there is any gain in extending the long runs beyond three hours or twenty miles. It takes me 3 hours 40 mins to get up to 20 miles on a good day at present; the risk of me training to 22 or 23 miles would have been to be reported as a missing person! I settled for training myself to run continuously for up to 3hs 50 minutes- the self-imposed limitation probably harmed my time at Stratford. Following on from this last point; How much training is feasible for you? Other commitments may mean the kind of programme I’ve suggested is too much or you have taken on your first marathon at relatively short notice. This might mean rather than not do a marathon, you just need to adjust your expectation as to what is achievable in terms of a time. Personal preference really. A Spring marathon involves winter training; I prefer this as January to March is a time of year when there are few distractions or public holidays, or your two weeks in Fuerte-Ibinapa to get in the way. You will need a strategy for managing Christmas if your Marathon is early Spring. On the other hand, how much training in the summer heat do you fancy? 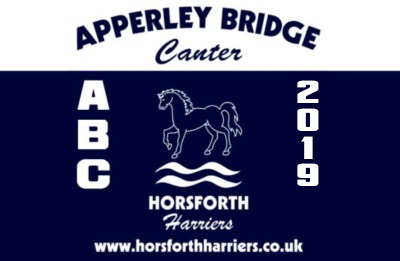 There are far more marathons available than is commonly recognised, there is a marathon on our very doorstep using the Leeds-Liverpool canal for example. Some marathons may only have a few hundred entrants. Being part of a smaller field may mean running isolated for a time- especially if like me, you are not ever going to trouble the leaders. But no one thinks negatively of those at the back of the field, rather the contrary in fact. Obviously, you must set a target marathon to structure your training around. If producing a time is important to you, do not fixate on a target that can’t be reached. It makes sense (and was a lesson learned the hard way) to complete all the training you intended to; don’t be afraid of switching to a later event, give yourself recovery time and the best chance of being the best runner you can be. Milton Keynes is not as glamorous as the some races but they are all 26.2 and at least you’ll get in to MK! There is no point in pretending that natural ability does not exist. From the very limited reading I’ve done, it is not as simple as TALL + SKINNY= FAST. Some people respond much better to training than others, a phenomenon known as ‘differential training response’. Women are particularly pre-disposed to be good at endurance events. The following table shows what can cause fatigue and how you can manage it. I have all these problems- but my now rather pleasing midriff suggests I might have cracked abdominal strength! Ask someone who knows what they are doing, to demonstrate the exercises first. Demonstrations can also be found on line and we have club members with a real knowledge of physical conditioning. The naturally gifted person probably has good flexibility, a strong lung capacity, a naturally high lactate threshold and good responsiveness to training. Being as physically strong as you can be will reduce the chance of injury. A #1 Marathon in my scheme. What drives an individual to do a marathon varies and is often triggered by a pressing emotional need to put oneself on the line for something or someone. Only 1 in 200 people have completed a marathon; most people won’t contemplate it. Getting around and getting the sponsorship and t-shirt are laudable aims and big city races, with often generous cut off times are the ‘go to’ option here. If you walk the entire thing it will take nine hours and will probably exceed any cut-off. If you can run 13 miles and power walk the other 13 you will complete. It might be sensible to do short bursts of running with short bursts of power walking. If this is your aim then try and do as much long steady running at your marathon pace as you can in your training period, with your longest run three weeks before. New marathoners will have to develop a hydration and nutrition strategy. This has to be practiced in training. I took seven high carbohydrate gels during my last marathon- I’m used to them- but this is very much down to the individual, jelly babies (which are not veggie btw), Kendal mint cake, flat coke all can work. Concentrated beetroot juice two hours before the start can also be helpful. Expect to take on a litre or more of fluid over the course of a marathon. Your body will need food and fluid for any long or intermediate run (more than an hour) but remember also sun cream, proper ‘wicking’ socks, baseball hat and Vaseline as your essential friends, helping you to the finish in ‘comfort.’ Never race in new untried clothing. I would personally choose the Greater Manchester Marathon in early April as a good first marathon. Local, easy to get a place, flat as flatulence and very well supported by the public- some logistical problems in recent years notwithstanding. I didn’t have any after my first marathon. I do now. A marathon is much further than what most runners usually do. 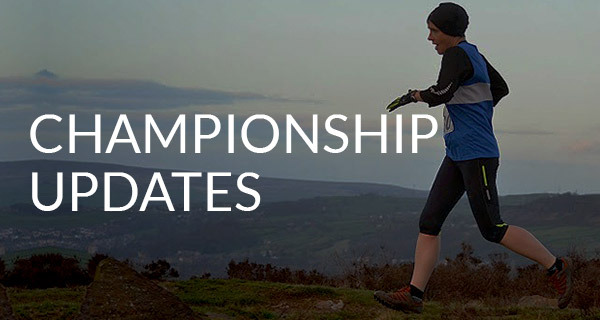 The most popular endurance event nowadays seems to be the half marathon- you can get away with training up to 10/11 miles for that. For those of you that want to progress from a first to a second marathon, don’t let your base fitness get too low in the (probably) considerable hiatus between marathons. Keep the very long, steady run in your life-this will help preserve your base for your next stint of marathon training. Start from base camp not the foothills! And the other regret- failing to take my own advice!